Note: You may need to click your Refresh Button to view the newest photos. We have renovated our Free Food Pantry - and are in the process of renovating our Church at this point. Below is a picture of our new Pantocrator (Icon of Jesus Christ - the King) that has been installed in our Church! This is the Pantocrator (Christ the King) in our ceiling. This reminds us that Jesus Christ is the undisputed Head of the Christian Church, and that He sits enthroned in Heaven at the Right Hand of God the Father. This is a panoramic view of the front of our Nave. 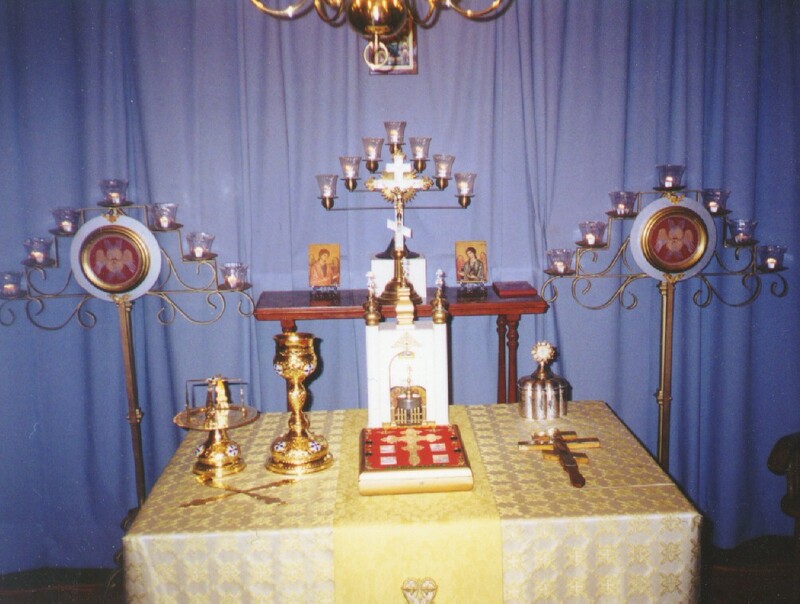 In the Eastern Orthodox tradition, the Sanctuary is where the Altar is, behind the Royal doors in the center of the Icon Screen. The Nave is where the congregation sits. We have almost completed the re-face of the Icon Screen - As you can see we have made significant progress! This is our Altar Table. It is located in the Sanctuary behind the Icon Screen. One of the major precepts of Orthodoxy is "Let the Walls Teach". 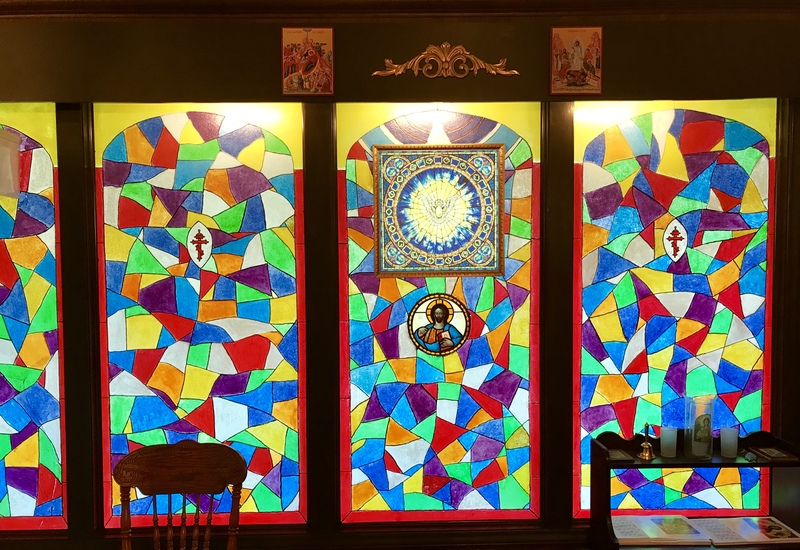 We take that seriously at St. Seraphim's with our numerous Icons on our walls! 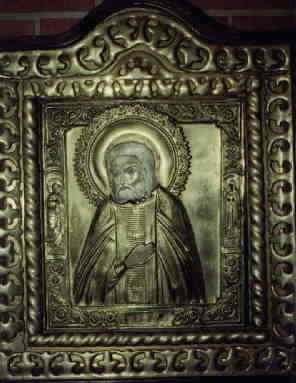 "Our Little Miracle at St. Seraphim's"
St. Seraphim's was the site of a miracle on July 7, 2001 - the Icon of the Holy Protection of the Theotokos (shown above) is a just a copy of the miraculous Weeping Icon at St. Jude's Shrine. On July 7, 2001 oil came from the hands of Theotokos. This oil filled the air in the Church with the fragrance of roses. So much oil came from her hands that it actually removed the color from the clouds below her in the Icon. Metropolitan Roman declared July 7th the commemoration of Our Lady of Holy Protection of High Point in honor of the miracle. The oil stopped after 7 days, and it was not until March 2002 that the Icon again exuded oil from her hands this time for only one day. On Palm Sunday 04/20/2003 oil came from the hands of the Theotokos again for one day. The Icon continually exudes the fragrance of roses, it often fills the entire Church with a beautiful fragrance. 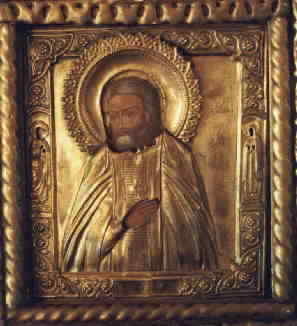 These two pictures are of the same icon of St. Seraphim. This icon is an antique from Russia. Sometimes when it is photographed it appears as you see it in person (right); however, sometimes it glows, just like St. Seraphim glowed with the Holy Spirit during his conversation with Motovilov! PLEASE, COME WORSHIP WITH US! St. Seraphim’s is a small but growing church that has been in the Triad area for 11 years. We are a member of the The Holy Eastern Orthodox Church of the United States. (THEOCUS) Our primary worship service is the Divine Liturgy of St. John Chrysostom which we celebrate every Sunday morning at 11:00 AM. All of our worship services are done in English. We are located on the corner of Eastchester and Johnson Streets in High Point. We are at 303 Eastchester Drive in High Point - we are located on the same property as St. Christopher's Episcopal in the building behind St. Christopher's.